Alarm bell sounds when drawer is opened. 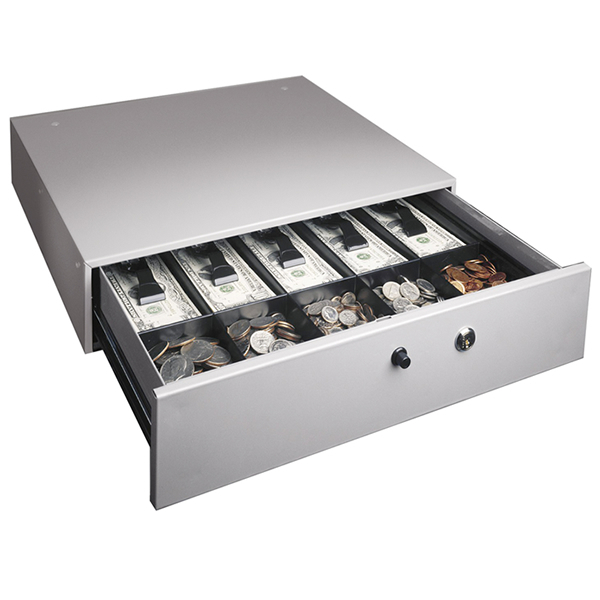 The Manual Cash Drawer features a deadbolt lock and a touch-button release to open drawer without key. Optional alarm sounds when drawer opens. Grey enamel finished steel drawer has stainless steel roller bearings for smooth operation. Unbreakable ABS cash tray has 5 coin and 5 bill compartments with heavy duty spring-loaded bill weights. Includes mounting hardware.